It is our pleasure to present to you a Dolly Insider exclusive interview with the talented duo known as Kinoko Juice. In this month's interview, Kinoko Juice talks about the origin of the name Kinoko Juice, what inspires their creations and their plans for the future. 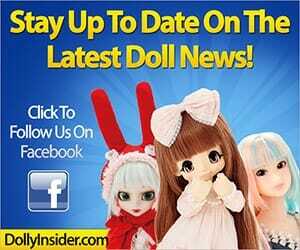 By the end of the interview we hope you are inspired and that your love for Kinoko Juice dolls will continue to grow. 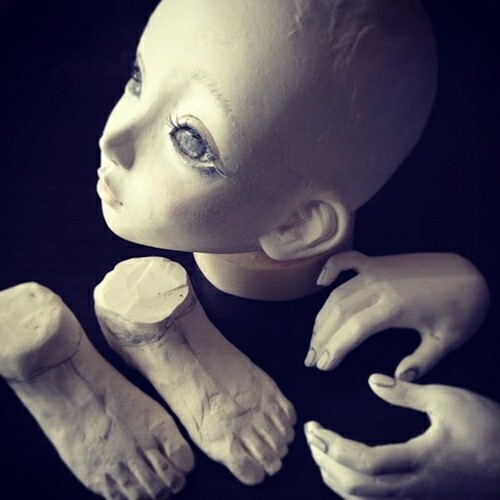 The two person unit "Kinoko Juice", made up of a man and a woman (Koji and Kame), focuses on creating and selling original resin cast dolls, as well as doll clothing, accessories, and custom orders, among other things. We're always in search of cute things. What does Kinoko Juice mean? We wanted to use the name Kinoko because icons with a mushroom motif look cute, and for mushroom flavored juice, anyone would get excited over asking what that would taste like, so we had that in mind when we were thinking about making that sort of name. How did the Kinoko Juice brand begin? Did you customize other dolls before starting the Kinoko Juice brand? 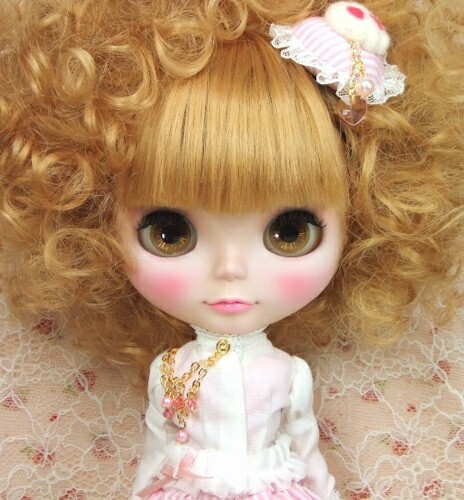 We've customized a Blythe doll, and done the make up for a 1/6 soft vinyl doll. 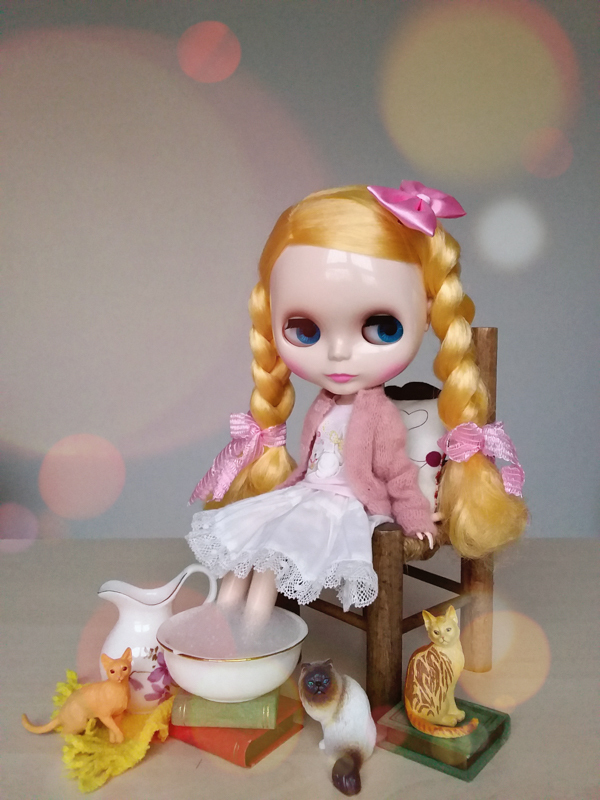 Your dolls have so much personality & style, where does the inspiration come from? Mainly, we get inspiration from looking at fashion magazines for kids, Japanese anime, and figures, among other things. How did you come up with Sunny Bunny Date girls? Previously, during the creative process, we've made various things such as capes and parkas with an animal motif. 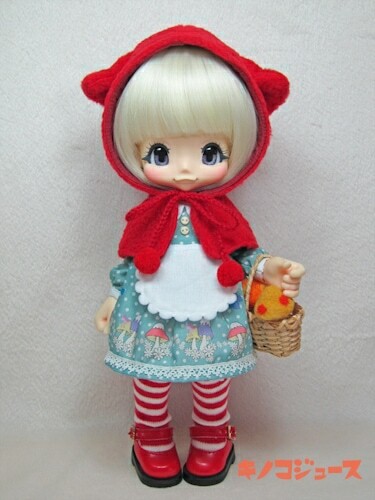 We felt that Kiki (Kikipop) looked very nice in a hood or a cap,and up until now, we hadn't made a bunny, so we mainly thought about going with a lop eared cape. And so, we thought about pairing it with an original print dress with a bunny pattern, which ended up as the current design. What is your favorite feature of KIKIPOP! Sunny Bunny Date? 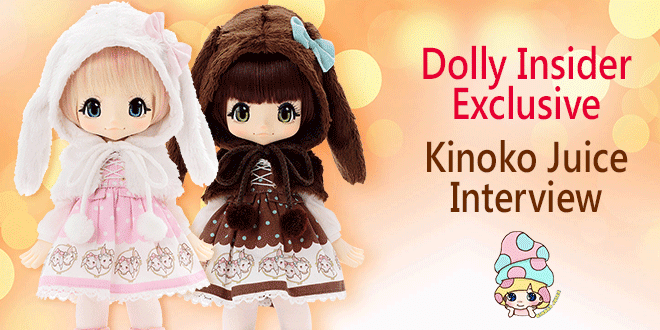 How does it feel knowing that your dolls Chiika, KIKIPOP!, KIKIPOP!2 are now in the hands of collectors worldwide? so we're truly happy that we've worked while having faith in what we've considered to be cute up to now. We're overwhelmed with happiness from being able to see so many people from around the world via the Internet showing their love. However, it feels like we still have to work hard so they can be loved forever. Particularly, in regard to our original creation "Kiki", although we wanted to send her out to lots of people, we found it hard to keep with production, so it was very irritating, but in this way, after about five years of development, she's been born anew as Kikipop!, so we're very happy that we can now send her out. And so, the source of our strength comes from the people who love Kiki and Kikipop. In regard to Kikipop, we want to someday develop a series with Japanese clothes. 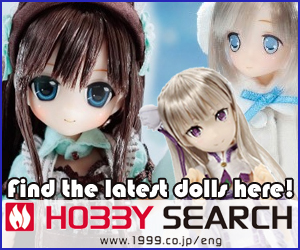 Currently, Kinoko Juice is working on developing new, larger sized dolls. We hope you will get a chance to see a new aspect of Kinoko Juice. We'd be so happy if you're looking forward to it. For news about Kinoko Juice, updates are posted on the blog on the homepage and on social media. The Dolly Insider would like to thank Kinoko Juice for taking the time to answer our interview questions and for sharing their story with us all. We hope you, our readers, are now more familiar with the Kinoko Juice and the people behind these beautiful dolls. you are the winner of Hello Kikipop Marmalade Brown! All you have to do is leave a comment on our blog in the comment section below related to the interview or Kinoko Juice or KIKIPOP! dolls. Thanks for reading the interview and taking part in our Hello KIKIPOP! Marmalade Brown Giveaway. If you like to see similar interviews in the future please push any of the “Share this” buttons below the interview to share it with the doll community. Starting to really look into dolls by Petworks and along came a few other dolls such as kinoko juice. I really think the bunny version suit this character best. Hope to see more information on the bigger bjd soon! Thank you for the great interview! It is nice to learn so much more about these dolls and their designers! Great information. I was curious as to the history of these dolls. Love to the see the photographs, too! Wow, so interesting to hear the thoughts behind Kikipop girls. I fell in love with their gorgeous faces and I can’t get enough of them ever since. I hope they continue to design more and more of these beautiful girls. Thanks for keeping us up to date! 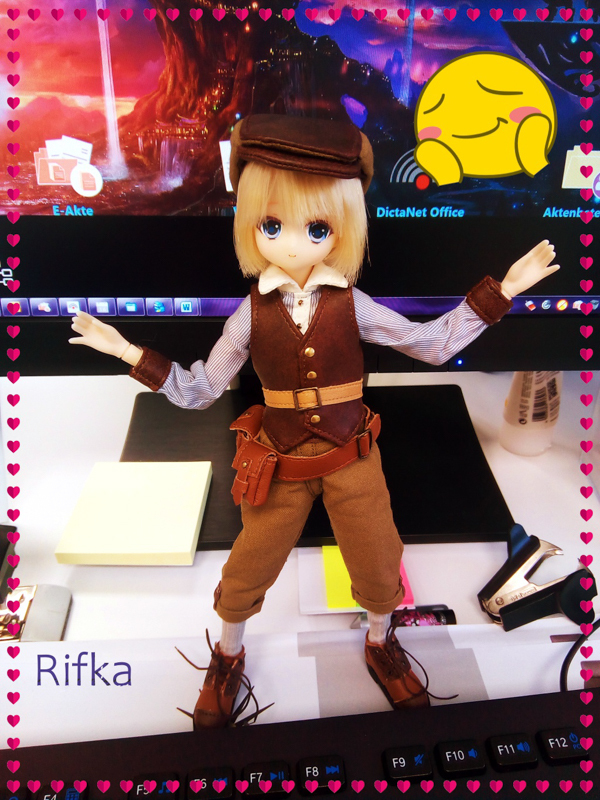 I adore the Kinoko Juice dolls and am so grateful for Azone being able to produce Kiki for the rest of us to enjoy. Thank you, Dolly Insider for keeping us up to date with the creators and their amazing children! Wow awesome interview. It is always so interesting to hear from the creator’s of Kinoko Juice. Also the new doll they’re creating looks gorgeous. The kikipop dolls are just so cute! I can remember the excitment in the BJD hobby when it was announced that Kinoko Juice’s Kiki would be made much more available by Azone. Great interview, thank you for posting this! I’ve been curious about these dolls after seeing photos in Dolly Japan. That’s so cool that Kinoko Juice is a duo! Their designs and mushroom motif are all so cute! I look forward to seeing their future projects, I think a series with Japanese clothing has so much potential! It’s very interesting to get some insight on artists like this. I remember when the Kiki dolls were extremely difficult to get for anyone outside of Japan and it still seems surreal that these dolls are now available to the world as Kikipop! I’m glad Kinoko Juice was able to “spread the love”, so to speak. Their next big project looks quite awesome and I can’t wait to see what they have in store for the future. Thank you so much for this interview! Since the first two dolls released in this adorable line I have scrambled to find more information about them. But seeing as I only have a iPad, many of the sites I have found wouldn’t translate. I have learned a lot and my love of this line has only grown! Thank you for sharing the interview! I love how they got decided on their brand name. Kinoko Juice really is cute and interesting sounding! I look forward to seeing more and more of their creations. It is so much fun to learn more about Kinoko Juice. 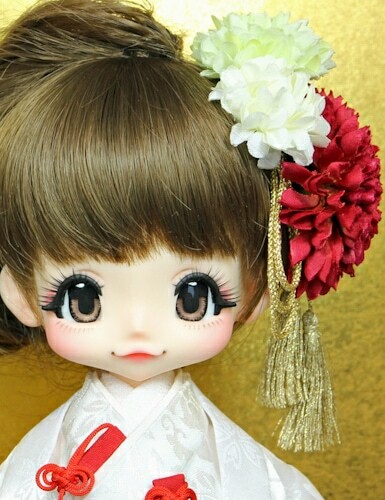 With its distinctly modern Japanese feel, I think Kikipop would be perfect for a traditional Japanese clothes version. It is bittersweet to hear that Kinoko Juice is moving towards bigger dolls. I like that the company is expanding it’s lines, but 1/6 scale dolls are my favorites and many companies are stopping making that size. I love Kikipop and just so lucky to have 3 already. Still saving up for the next 3. Been collecting dolls for so long but this is my first that I really have to get all of them. My wants usually come and go for dolls but surprisingly i am looking forward to Kikipop’s that are coming soon. More power and more dolls to come hopefully!!! Thank you so much for this interview! I really love kinoko juice’s work and it’s cool to learn a bit more about them (like some other people I didn’t even know they were a two person team haha). It’s a bit sad that it is nearly impossible to get their resin dolls outside of japan but at least we have the azone releases. Thanks for the exclusive interview. I enjoyed learning about Kinoko Juice and what inspires their creations. 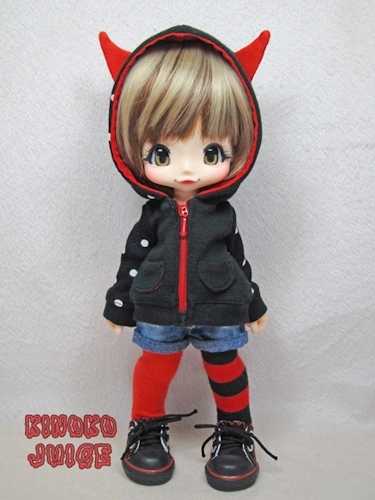 The KIKIPOP dolls look so cute with their animal hoods! Their dolls are so cute! I’ve been interested in them for a little while now, and it was really cool to learn about the people and the inspiration behind them. It would be interesting to see how these dolls or this style would look at a larger scale. They are so insanely adorable. I love Kikipop! I love that they come in sets. They look so cute together. I love the Jill doll as well, I hope she may become a Jillpop one day! Thank you for the interview with Kinoko Juice! Thank you so much for this interview! I was so shocked to see it. I always wanted to know more about the artist. I am even more shocked that they are a two person team, I always thought it was one person. I hope that they eventually release Kikipop Jill, and that we get lots more clothes for them. Gawwwwwww She knows the passion of Blythe. Omgosh I wonder if they’d do customs. This is so awesome and I’m so excited for my new girls. I hope they know that her girls are two sweet and I love them!!! I hope the line continues and I look forward to more girls. I hope. Fantasy blue and fantasy eyes are coming. I am in love with these dolls and their cute faces! Thanks for giving us a little insight into their background.. I love reading about behind-the-scenes stuff and would love to see something even more in-depth someday! Wow! I just learned more about my dolly hero, Kinoko Juice! Thank you folks here at dollyinsider for holding an interview with Koji and Kame. The Kiki and Jill dolls are probably my favorite dolls. Such a unique pair! Best of luck to everyone entering the contest. It’s great you got this interview! Before this, I had no idea Kinoko Juice was a two person collaboration, I’d always thought it was one artist producing dolls on her own. Well, her and her pug that she posts on instagram, but I don’t think dogs can help make dolls. I’m excited for more fashions for Kikipop too; they’re so good at coming up with cute clothes for Kiki. The cat hood capes are way, way too cute. Mostly I’m hoping they’ll make a Kikipop of the Kiki with the 😮 face. Not that regular Kiki isn’t adorable on her own, but that face in particular melts my heart.